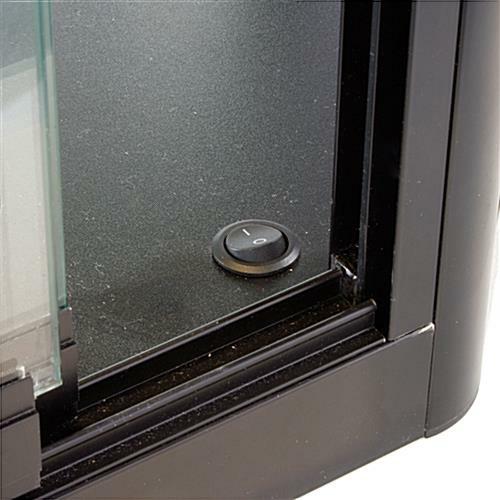 These angled-front jewelry showcases are a great choice for jewelry stores, but could also be used in gift shops, a business lobby, or department store. The extra-deep showcases will proudly display jewelry, makeup, electronics, eyewear, souvenirs, action figures, sports memorabilia, trophies and much more! 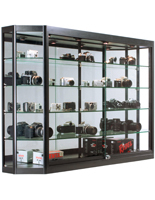 Wall-mounted jewelry showcases are an excellent choice for busy, small or crowded commercial locations. The showcases utilize wall space, rather than floor space, leaving your store more open for the free flow of traffic throughout. 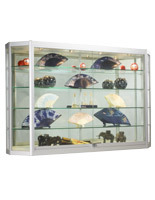 These glass displays, jewelry showcases can be wall-mounted behind a checkout, service or sales counter to display expensive or fragile items, or simply to encourage impulse purchases at the time of checkout. 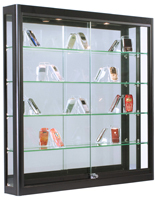 Jewelry showcases, also known as glass displays, are crafted from black powder-coated aluminum and tempered glass panels. 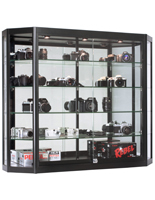 The jewelry showcases feature four fully-adjustable, rubber-cushioned, tempered glass shelves, with a maximum load of 30 lbs. each. 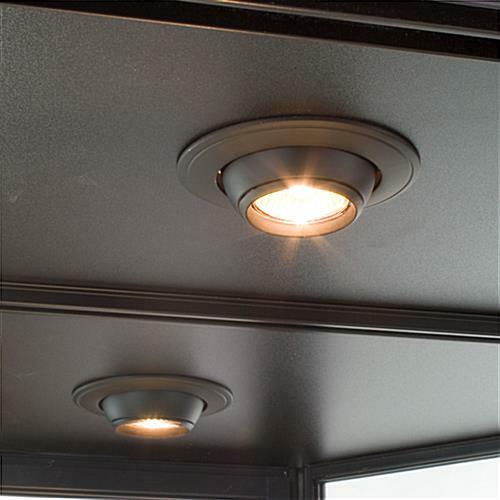 To highlight displayed items, the showcases are equipped with four 20-watt recessed eyeball-style halogen top lights, and a mirrored back. 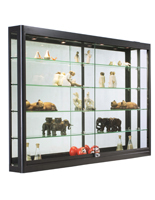 This is one of the largest wall-mount jewelry showcases offered, measuring 58"w by 39.5"h and 11.5"d (twice the depth of traditional jewelry showcases). 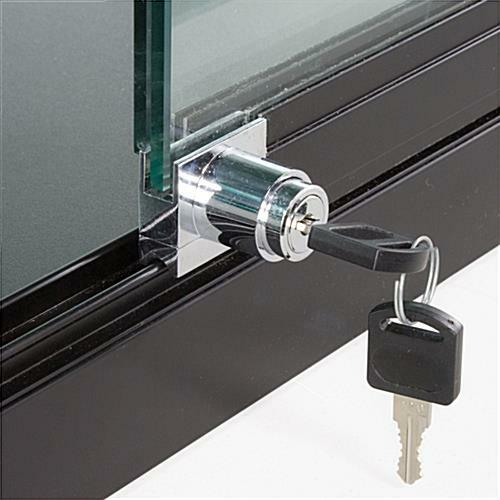 The glass displays feature sliding doors with a plunger lock to allow access only to authorized individuals. 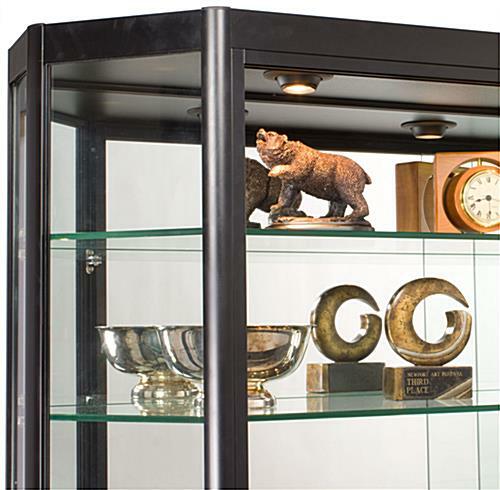 These memorabilia displays ship fully assembled so you simply have to hang it on a wall with (2) included z-bar mounts and fill with sports memorabilia, trophies, collectibles, electronics, or jewelry. Mounting hardware and Mounting Instructions. We ordered the cabinet on Monday and took delivery Thursday, same week. Packaged very well! We are using it to display a collection of coins, both new and old. Still adding to the cabinet. Looks stunning. Have received many compliments on the cabinet. 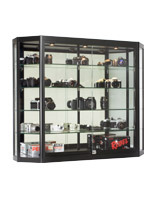 Your coin collection looks amazing in our display cabinet! No wonder you've received so many compliments. Thank you so much for taking the time to share this with us, Gregory. 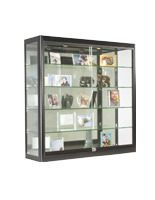 We hope you'll continue to turn to Displays2go as you grow your collection. Thank you so much for taking the time to write this excellent review, Mark! 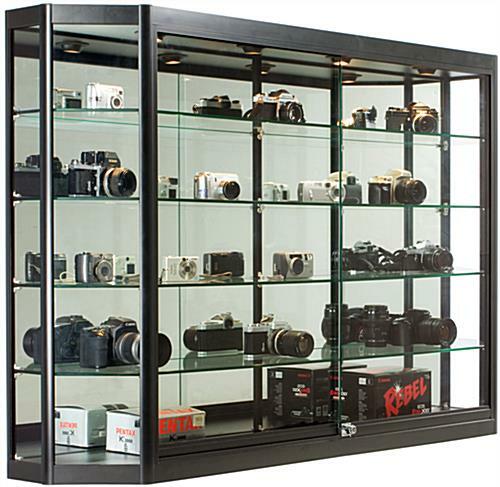 We're so happy that this display case has exceeded your expectations. Love the display case. Perfect for my collection. When I need more space to show off more, I will buy another one of these. Thanks for the awesome review, Brad! We love to see how our customers use our products! Unit is great except for one of the lights will not light up, other than that, great for what we use it for.